We were diggin’ through our archives and found a nice batch of black & white 35mm film shots from an Open House day at DBO Motor Racing in Monterey, CA. These were a treat to find and we’re glad to share them with you. Enjoy. We've been going down to Chicano Park in San Diego, CA for Chicano Park Day since 2006. The show is still one of our favorite shows to attend every year. There isn't any show in the world like it. Here are a few shots we took back in 2007. Enjoy. About 2 week before the 2007 Lone Star Round Up I ran into local creative Rod Powell at the local Foster Freeze. Rod asked me if I wanted to be his co-pilot on a 2 week road trip to Austin & back in his 1956 Chevy handyman wagon. The next day I went to my boss and told him that in a week I was leaving for 2 weeks. I told him I wasn't asking I was telling him, and that if I had a job when I came back I would be very happy. Luckily he said I would still have a job. Here are a few shots I took of Rod's Chevy wagon & Lee's shoebox along the way. Enjoy! Our first stop, The Brewery, Lee Pratt's home at the time. ... and also stopped at many steakhouses. We stopped at a very neat old dealership / gas station in the middle of nowhere that Lee almost bought. Lee & Suzanne leading the way. I don't think we had a bad meal the whole trip. A look inside Rod Powell's wagon. Once we arrived in Austin we met up with some great people who became good friends. On our way back home we had less stops but we made sure to stop at Cadillac Ranch. As you may know we're a 2 man show, we'll be on the road from April 4 - 11, 2016 all orders ordered between now and the 11th will ship the 12th. Sorry for the inconvenience this may cause. Thanks for the continued support! It's been a tradition for us (since 2007) to make the trip out to Austin, TX for the Lone Star Round Up. In 2010 we drove a chopped Ford shoebox custom with no side glass, no back glass and a lot of wind & water from Salinas, CA all the way to Austin. It was a cold & wet but great trip! Here are a few shots we took. Wish we would've captured more but as usual we were running late & in a hurry. Here is the shoebox really early in the morning in the middle of nowhere. A couple of customs parked on South Congress. Both were driven from Northern California. We'll be making the same trip (in a SUV) next week. See ya'll there! Hard to believe these day but back in 2007 when Donnie Baird debuted his 1963 Olds not too many were painting lace roofs and panels on their customs (outside of the low rider world). Donnie's Olds was a breath of fresh air in a time when many were trying to be different just to be different. The simple yet beautiful painted body with a lace & paneled roof pays great tribute to the bellflower days. Enjoy these shots we took back in early 2007. Yesterday I was doing a little spring cleaning and found flyers we printed back in 2004 with Billy Wishart's hot rod. So I figured I'd dig into an external hard drive & find more shots we took of Billy's car. This is back when we shot with a Canon 35mm camera. Enjoy. 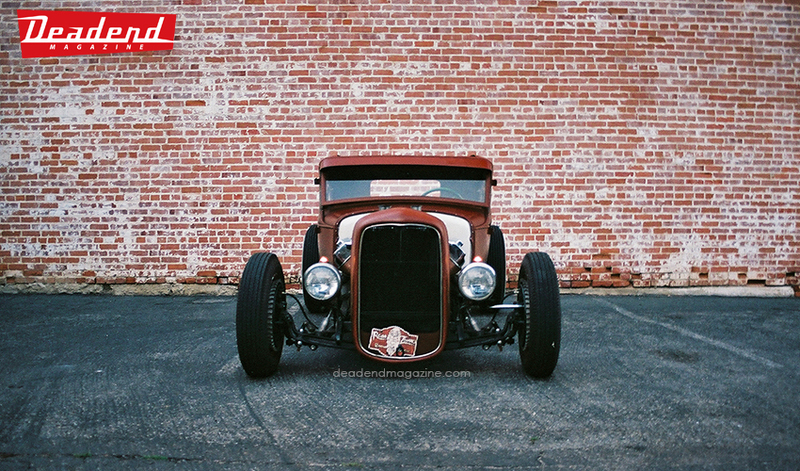 Early 2010 we spent a few days shooting with Cole Foster & Aaron Elliot and the iconic 1936 Ford they built for Metallica's Kirk Hammet. Many of you know the car very well. I don't think we need to go into detail about the car, instead we'll show you some shots we took around Salinas, CA. The 36 looked amazing flying down the freeway. We stopped by Rega's shop and shot a few shots with Job Stevens' "Berzerker" chopper. Sometimes you just have to park on the front lawn. I remember driving from Ventura, CA (the coast) to Ojai, CA (only a 30 minute drive) and noticing how much hotter Ojai was that day than Ventura. Our friend Tommy invited us to go and even though the temperature was up in the 100's (or at least it felt like it) it was cool to see some cars we hadn't seen and visit a place we rarely visit. The best thing about what we do is the adventures we go on and the friends we make on those adventures. In 2007 I went on a wonderful two week long road trip with Rod Powell and Lee Pratt from Salinas, CA to Austin, Tx and back. I met many people on that trip. One group of people I got to meet (and am still friends with) are a few members of the Road Rockets Car Club from Texas. One night while in Austin these fellas took me out to dinner for some burgers and before we headed back to the madness on South Congress I snapped some shots of their cars at their hotel parking lot.